"An hour before his official retirement began Tuesday afternoon, long-time treasurer-collector, Jim Dacey, reflected on his 18-year career in municipal government. He spent his day doing the usual work, but with cohorts of citizens and co-workers alike coming to wish him a happy retirement, it was hard for Dacey to see things being business as usual. Dacey’s successor and previous assistant treasurer-collector, Kerri Bertone, has officially started in the position full-time." "With a large turnout expected, the town election is set for Tuesday, Nov. 7. Franklin High School. 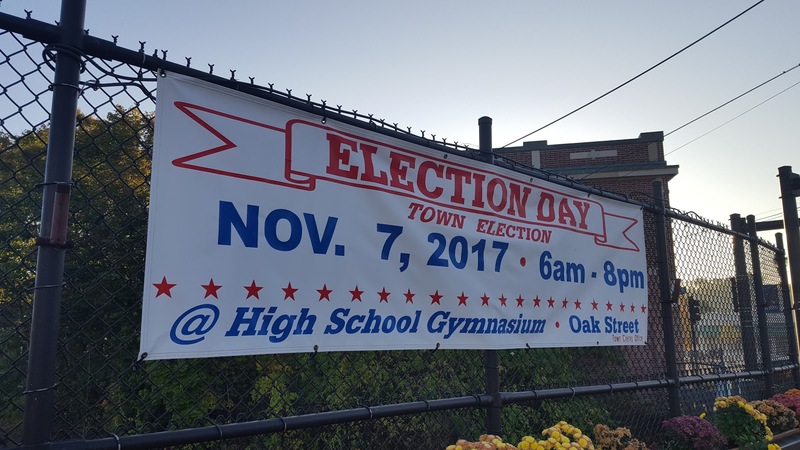 Polls for all precincts at Franklin High School are open from 6 a.m. to 8 p.m. There are nine seats open on the Town council with 12 candidates. For the School Committee, there are seven open seats with eight candidates. In the race for the Board of Health, two candidates are running for one slot. The race for a seat on the Board of Assessors is uncontested, as well as three available seats on the Planning Board."